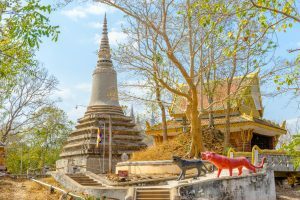 Phnom Prasith is located in Makak commune, Ang Snoul district and in Chhviang commune, Ponhea Leu district, north of Phnom Penh. To get there, take National Road 5 north about 11 kilometers to Prek Pneuv Market point. From there, turn left and drive another 13 kilometers along a dirt trail. The total distance is about 24 kilometers from Phnom Penh or about 35 kilometers from Takmao provincial town. In the future, once National Road 26 is completed and the trail to Phnom Prasith is improved, visitors will be able to visit Phnom Prasith, and then continue on to Phnom Udong. Or, they could visit Udong first and Phnom Prasith later. 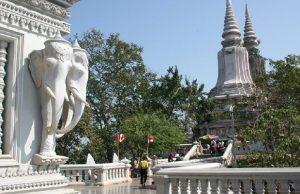 Phnom Prasith is composed of two hills, the East Hill and the West Hill. The West Hill has no stories. 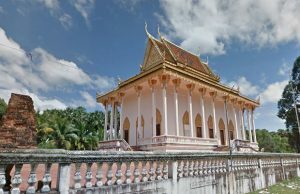 The East Hill, however, has stories relating to religion and the Khmer king. It also has a large statue of the reclining Buddha reaching nirvana.There are not many big trees in Phnom Prasith, and there are no development plans for now. The site attracts few visitors because there is poor organization and management. Nevertheless, this area has beautiful scenery, abundant fresh air and is rich in culture and history. 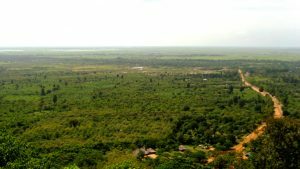 About 1 kilometer from Phnom Prasith, there is a man-made cultural site called Phnom Reap or Prasat Vihear Suor. Based on the style of Angkor Wat which is why it is called the New Angkor Wat, Phnom Reap was constructed of stone and cement between 1996 and 1998 for about 1 million US dollars. The money was raised from local and foreign sources by Mr. Meas Sarin.Today, Phnom Reap attracts many Cambodian and foreign tourists. It is often used as the backdrop for Cambodian videos.